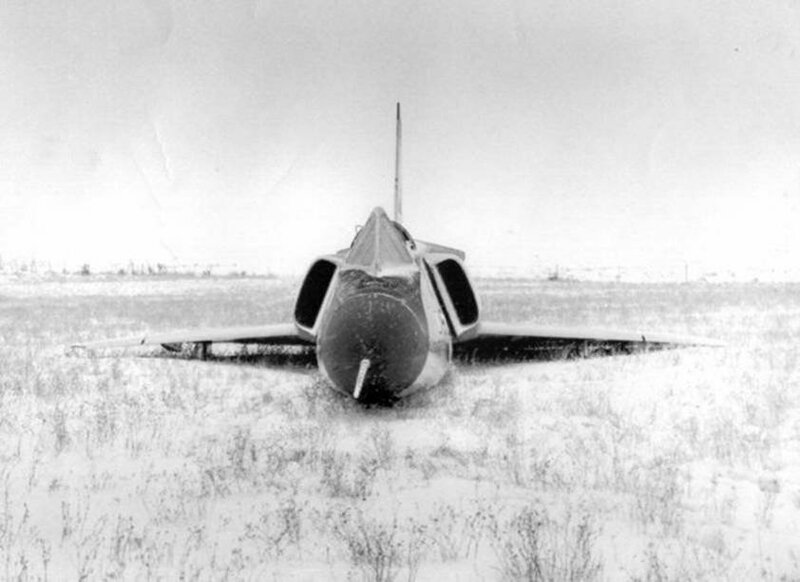 Fighter jet in cornfield...1970, while assigned to the 71st FIS at Malmstrom AFB , Montana , its pilot ejected during an in-flight emergency. 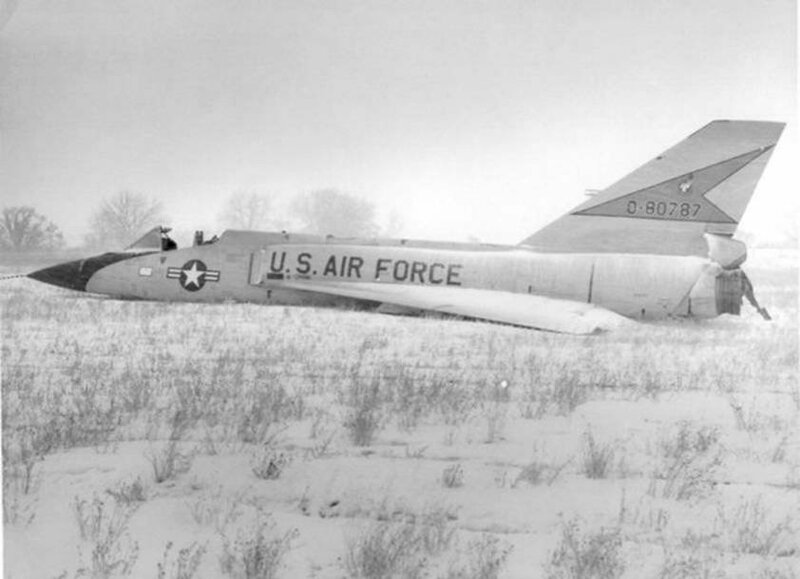 The pilot somehow got himself into a flat spin -- considered generally unrecoverable in an F-106 and he did what the flight handbook said to do -- get out of it, i.e., eject. After the pilot did just that, 58-0787 recovered itself from this "unrecoverable" situation. In a vain attempt to break the spin, the pilot had lowered half flaps, rolled in takeoff trim, and throttled the engine back to an approach power setting. 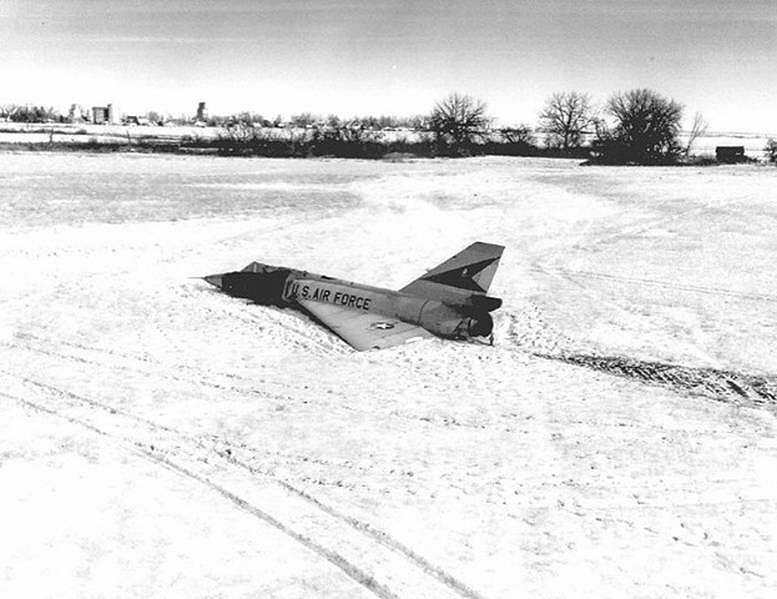 After the ejection, the aircraft recovered from the spin on its own, and established a wings level low rate descent under reduced power to the ground. Ground effect broke its rate of descent, and it settled into a near-perfect gentle belly landing in a farmer's snow-covered cornfield. When the local sheriff came upon the scene, the engine was still running. The aircraft was situated on a slight incline, and was creeping forward slowly under the thrust of its still-running engine, as the snow compressed to ice under it. Concerned about where it might be headed, the sheriff didn't think he could wait for the recovery team to get there from Malstrom which was about 50 miles away; so he got himself connected to the aircraft's squadron for engine shut down instructions before he entered the cockpit to secure the engine. The attached photos show pretty much what the sheriff beheld on that fateful day. A depot team from McClellan AFB recovered the aircraft and it was eventually returned to service. When the 71st FIS was disbanded in 1971, 58-0787, now famously known as the "Cornfield Bomber", was transferred to the 49th FIS, where it finished out its operational service life. Pilots of the 49th FIS would occasionally run into ex-71st FIS guys at William Tell and rag them unmercifully about the "emergency" so dire that the plane landed itself. 58-0787 is now on permanent display in its 49th FIS markings at the USAF Museum at Wright Patterson AFB , where its story is told in the exhibit. While the 49th FIS Eagle jocks are reportedly glad to see their squadron immortalized in this way for millions to see, they would prefer to see it made more clear that it was the 71st, and not one of theirs, who jumped out of this perfectly good aircraft.. They Have Never Left One Up There.